Hi everyone! Some of you may know Ella, some of you may not. Just to give you all a quick run down. 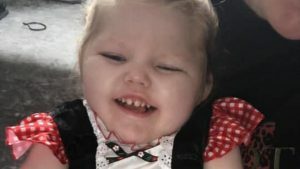 Ella suffered a bleed on her brain at 6 weeks old – which left her with a hypoxic ischemic injury which caused her to have quadriplegic cerebral palsy with spasticity and dystonia Seizures are a part of her daily life where she can sometimes have up to twenty a day, but we try to control them with her medicine. She sometimes shows reactions to lights but then she was registered blind at the age of 1 which means shes never seen any of her family. Ella has been in PICU twice already in an induced coma, and suffered and overcome pneumonia twice in her small life. She doesnt have a safe swallow so needs to be peg fed 3 times a day – twice in the day she enjoys blended diet things such as weetabix, spag bolognesse, chicken dinners which goes straight down her peg. She has medicines every 4 hrs to try and keep her comfortable along with all the change in positions and physio she has! Caring for Ella is a 24hour job. We all live in Hexham and Ella has an older brother Charlie who is 5, and absolutely adores ella! Sometimes he will say to me mummy why cant ella play? mummy when will ella walk or talk? And the honest truth is, i dont know and these things may never happen, or wont happen as the doctors have said. I want to take Ella to Panama city in america, for Stem Cell Treatment where she will recieve 40 million expanded allogeneic mesenchymal stem cells which will try and help repair the brain damage, this isnt a guarantee though. We could go all the way and it not be successful but also travel all that way and give her the best possible chance in life. It could reduce seizures, reduce spasams, help with her vision. The possibilitys are endless and i have read amazing reviews and stories from this clinic! Ella really doesnt get to enjoy the simple things in life as we do and the things we all take for granted on a daily basis. It would mean the world to Ella and all of us if you could please donate and take part in helping to raise the amount to get her to america and give her the only shot at a better quality of life.